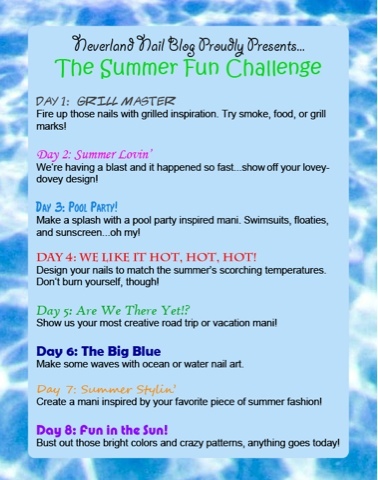 My fellow blogger Lindsey over at Neverland Nails has announced her latest nail challenge. I'm very excited about this as I've been wanting to participate in a challenge for a while. There will be 2 posts per week and it's all kicking off next Tuesday 19th June, so keep your eyes peeled for the first theme: Grill Master! The Summer Fun Challenge - Day 3: Pool Party! Fab Giveaway from" The Giveaway Lifestyle"